Supporters of Democratic presidential candidate Sen. Bernie Sanders cheer during his speech at Brooklyn College on March 2, in Brooklyn, New York. Socialism is a global movement that is growing rapidly in the United States, and it is anti-American to its core. 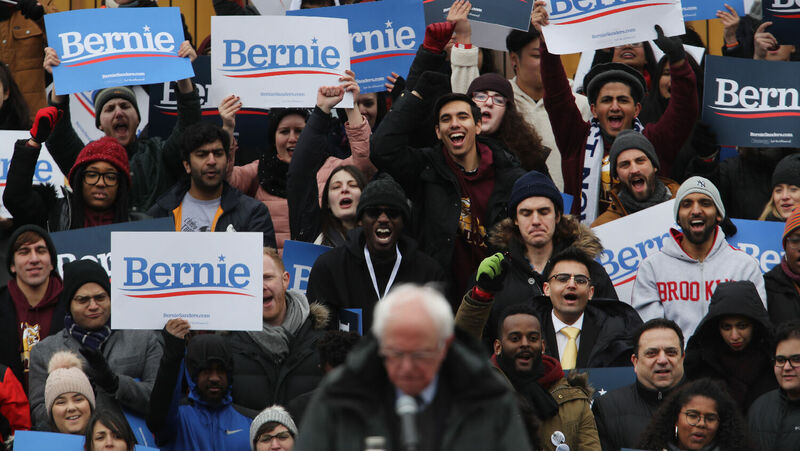 Despite socialism’s proven failure throughout history, a recent Harris poll reveals that America’s younger generations are now embracing this movement with increasing fervor. The poll, conducted in February among 2,035 American adults, found that 37.2 percent of all respondents would prefer living in a socialist country. Among millennials (those born between 1980 and 1994) and Generation Z (born between 1995 and 2015), the results were much higher. Nearly half of this group said that they would prefer living in a socialist country. More than 66.7 percent of those polled support universal health care—73.2 percent among millennials and Generation Z. Government-funded college tuition was supported by 56.2 percent, and 67.1 percent of millennials and Generation Z participants. The younger the generation, the more it supports socialism. Thomas Jefferson expressed a similar belief during his inaugural address on March 4, 1801, stating that the sum of good government is a “wise and frugal government,” that restrained men from harming each other, but “shall leave them otherwise free to regulate their own pursuits of industry and improvement, and shall not take from the mouth of labor the bread it has earned.” This is the freedom that the U.S. was established to uphold. Freedom to work, freedom not to work, and freedom to suffer the results. The founders followed a biblical principle of government: that individuals receive their rights not from human governments but from God, and they are accountable to Him for their own lives. Socialism puts control of citizens’ rights and lives into the hands of a few men at the top. The young supporters of socialism are gravely unaware of the destructive reality of what they support. Socialism, as presented by politicians and the media, sounds good. Over and again, the media hypes messages from politicians such as Rep. Alexandria Ocasio-Cortez talking about how wonderful it would be to have free health care for all, free college tuition for everyone, and a common standard of living for all citizens. To most supporters of socialism, “free stuff” sounds great, but when asked where the money would come from, their answers range from “taxes” to “the government” to “I don’t know where the money would come from, but they can figure it out.” All of a sudden, “free stuff” isn’t so free anymore, but the government can worry about that. It becomes obvious very quickly the kind of control this gives a few at the top. It is a level of centralized power that history has proved will always be corrupted. This scenario is exactly what the Founding Fathers worked to prevent. A government with power to redistribute wealth becomes very vulnerable to corruption. And as former British Prime Minister Margaret Thatcher said, what happens when you “run out of other people’s money”? The evils of socialism have been proved over and again, but many remain under the illusion that it will somehow produce good. Venezuela today is a perfect example of the end results of socialism. For its citizens, poverty, starvation, violence and death have become synonymous with socialism. Daniel Di Martino, a Venezuelan now living in the U.S., spoke about his experience in a socialist country. His family went from being an upper-middle-class family to earning just $2 a day. These are the facts about socialism that young Americans would do well to learn. They may not realize it, but the socialist America they envision will degenerate to the level Venezuela is currently at. Today, in the former socialist paradise that leftists loved to point to, 90 percent of Venezuelans live in poverty, up drastically from the 48 percent in 2014. Government corruption is rampant. In 2017, more than 2 in 3 Venezuelans lost an average of 24 pounds. Malnutrition is rampant. Medicine, fuel and food are scarce, forcing more and more people into the black market. Millions have fled the country. Those who remain teeter on the edge of civil war. Socialism is a dream world promised to those who will surrender their responsibility and accountability to the government in return for increased benefit checks. Venezuela is the reality. Watch the video below by Trumpet senior editor Joel Hilliker to understand what America must learn from Venezuela as it travels down the same path. Venezuela graphically displays the state a socialist America would descend to. We are edging closer to this reality every day. “Ah sinful nation, a people laden with iniquity, a seed of evildoers, children that are corrupters: they have forsaken the Lord, they have provoked the Holy One of Israel unto anger, they are gone away backward. Why should ye be stricken any more? Ye will revolt more and more: the whole head is sick, and the whole heart faint. From the sole of the foot even unto the head there is no soundness in it; but wounds, and bruises, and putrifying sores: they have not been closed, neither bound up, neither mollified with ointment. Your country is desolate, your cities are burned with fire: your land, strangers devour it in your presence, and it is desolate, as overthrown by strangers” (Isaiah 1:4-7). For more information on socialism’s rise in America, read “The Origins of America’s Dangerous Turn Left,” by Trumpet editor in chief Gerald Flurry.